In a move intended to cut federal spending and benefit U.S. taxpayers, the U.S. Department of Energy on December 16 released a plan to sell off its excess inventory of uranium. According to the agency, "The Department of Energy has a significant inventory of uranium that is excess to United States defense needs. This inventory is expensive to manage and to secure..."
Powertech Uranium Corp., along with other Canadian and U.S. firms, has been attempting to dissuade the DOE from disposing of this uranium because it will push down prices for the radioactive metal. They argue that the U.S. uranium mining industry could be hurt by the DOE sales and that a weakened mining industry would compromise U.S energy security. 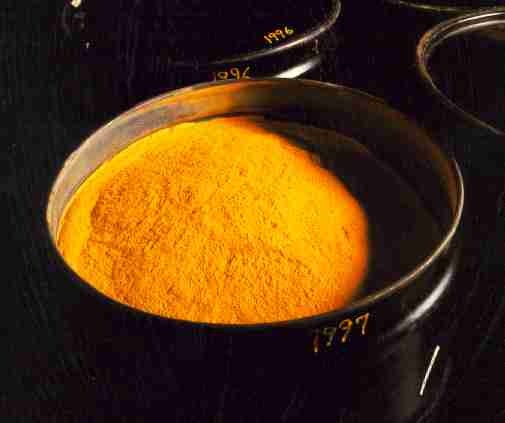 Uranium oxide, or "yellowcake", ready for further processing into nuclear reactor fuel. The Excess Uranium Inventory Management Plan calls for the sale of approximately 50 million pounds of uranium over the next ten years. Beginning in 2008, the agency plans to sell about five million pounds a year, which is 10% of the DOE's estimated annual requirements of the U.S. nuclear power industry. According to the DOE's Energy Information Administration, "Owners and operators of U.S. civilian nuclear power reactors purchased a total of 51 million pounds U3O8e (uranium oxide equivalent) of deliveries from U.S. government, U.S. suppliers and foreign suppliers during 2007." The DOE estimates that the annual requirement of about 50 million pounds will not change for the next ten years. The total production in 2007 from U.S. uranium mines was 4.5 million pounds from six underground mines and five in-situ leach operations. World uranium mine production was about 92 million pounds in 2007. In a March 11, 2008 policy statement, DOE Secretary Samuel Bodman expressed the department's belief that introducing five million pounds of uranium into the market per year "should not have an adverse material impact on the domestic uranium industry." The Uranium Producers of America, a Sante Fe, New Mexico-based lobbying group, has taken the lead in lobbying the DOE. The UPA's executive director, Jon Indall, has urged the DOE to "hold back their material", according to a July 7, 2006 interview by Mr. Finch. The UPA is an association of 13 uranium mining companies, including Powertech Uranium Corp. The UPA's mission is "to promote the viability of the domestic uranium industry." Ironically, nine of the 13 member companies are Canadian or are controlled by Canadian firms. Powertech and the UPA are fond of touting U.S. energy independence and energy security. In their view, higher uranium prices are the way to achieve these goals. High prices will spur development of U.S. uranium deposits, and this uranium could supply U.S. nuclear power plants, thus reducing their dependence on nuclear fuel purchases from unstable or unfriendly countries. Most of the DOE's excess uranium would likely be sold to U.S. electric utilities, thereby offsetting some of the need for imported uranium. Even so, the mining industry still opposes the plan because lower uranium prices would negatively impact the miners' operating margins. Eight percent of the uranium purchased in 2007 by U.S utilities came from domestic sources (four million pounds). Nearly half (44%) was from Canada and Australia. The rest came primarily from Russia (36%), with the balance (12%) from a handful of other countries. For comparison, roughly two-thirds of the crude oil and petroleum products consumed by the United States is imported. About 60% of these imports come from OPEC countries, as well as Russia, Mexico, and Brazil. POWERTECH TO SELL URANIUM TO BELGIUM AND INDIA? Since announcing the Centennial Project, Powertech CEO Richard Clement has repeatedly made public statements that Powertech would sell uranium only to U.S. utilities. In an August 2007 letter to project opponents, titled "Response to Concerned Citizens’ Questions Regarding the Centennial Project", Clement responded to the question "What market is the uranium mined by Powertech Uranium Corporation sold to?" Answer: Due to high demand, a deficit of domestic uranium supplies, and concerns about the security of foreign supplies, the uranium mined in the United States will stay in the United States for nuclear power generation.....Nuclear power generators simply prefer to buy uranium produced in the U.S., and we can provide them an adequate and secure supply. Ten months later, Clement changed his tune when he accepted a $9 million check from Belgian nuclear company Société Belge de Combustibles Nucléaires Synatom SA. Synatom signed a private placement agreement with Powertech giving the Belgian firm the option to buy uranium from the Centennial and Dewey Burdock (South Dakota) projects. Clement has also failed to mention that Powertech Chairman, Chief Operating Officer, and co-founder Wallace Mays has a five-year contract to sell 5.5 million pounds of uranium to the Nuclear Fuel Complex (NFC) in Hyderabad, India. The contract was signed in late 2006, after Mays traveled to India with a U.S. trade delegation. The contract is between the NFC and WM Mining Company, LLC, a Denver company formed in 1995 by Mays and attorney Leonard Waldbaum. The Nuclear Fuel Complex is owned and operated by the Government of India. "Initially the contract has been approved for five years but I am looking for a long-time contract. If it comes through, there would be business of 1.3m dollars annually with NFC," WM Mining's president Wallace M Mays said here Thursday [30 November] on the sidelines of a Indo-US business meet. 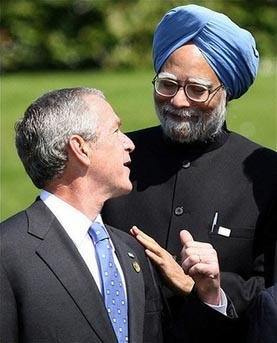 On December 19, 2008, the United States and India signed a bilateral agreement allowing U.S nuclear companies to sell nuclear fuel and technology to India, clearing the way for Mays to sell uranium to the NFC. The controversial agreement was first announced by the Bush administration in 2005, and its October 1 approval by Congress creates an exemption to provisions of the Atomic Energy Act that prohibit nuclear trade with countries that fail to cooperate with international efforts to control the proliferation of nuclear weapons. Under the agreement, India will allow inspectors from the International Atomic Energy Association (IAEA) access to its civilian nuclear reactors. However, India retains the right to designate its reactors as civilian or military, and to prohibit inspections of military facilities as well as its current stockpile of nuclear material. Prior to approval of the agreement by the U.S. Congress, the 34-year international ban on nuclear trade with India was overturned September 5 by a vote of the Nuclear Suppliers Group. The 45-nation organization works for the non-proliferation of nuclear weapons through the implementation of nuclear export guidelines. Reversal of the longstanding ban makes India the only country that may legally import nuclear fuel and technology despite its refusal to sign the nuclear Nonproliferation Treaty. Restrictions still apply to the transfer of certain enrichment and reprocessing technologies. India exploded its first nuclear bomb in 1974. The so-called "Smiling Buddha" test used weapons-grade plutonium produced in the CIRUS "research" reactor. The CIRUS reactor was supplied by Canada and was subject to a 1956 "peaceful uses only" contract. The United States provided an essential reactor component (heavy water) under the Atoms for Peace program, and had a similar "peaceful purposes" agreement with India. Agni-III nuclear-capable intermediate range ballistic missile. The Agni-III has a range of 2,200 miles and is designed to hit high value targets deep inside China. Five more bombs were detonated in May 1998, leading to unanimous condemnation by the world community. India declared that the five tests were "to help in the design of nuclear weapons of different yields and different delivery systems". Observers believe India may have a stockpile of 50-100 nuclear warheads (assembled and unassembled), although estimates vary widely. India has long had an active program to produce weapons-grade plutonium-239 at its two research reactors at the Bhabha Atomic Research Center near Mumbai. In addition, India has 14 operating pressurized heavy water reactors (PHWRs) that produce plutonium as a by-product of power generation. Thirteen of these PHWRs are currently outside safeguards of the IAEA that are designed to verify that nuclear materials are not diverted for use in nuclear weapons. The new U.S.-India agreement calls for bringing six of these reactors under IAEA safeguards by 2010-2014, leaving seven outside of international monitoring. In news reports from 2006, Mr. Mays explains that the uranium he intends to supply to India would be used in "two indigenous pressurized heavy water reactors." It is unknown if the two reactors would be under IAEA safeguards. India has modest uranium resources, and domestic mining has not kept pace with the country's program to construct nuclear reactors. Some recent attempts to open new mines have met with stiff local opposition. On May 10, 2008, the Indian state of Meghalaya announced that it would oppose any move to mine uranium in the state. Domestic uranium resources are insufficient to supply both India's civilian nuclear reactors and its nuclear weapons program. IS IT A GOOD IDEA TO SELL URANIUM TO INDIA? Critics call the terms of the agreement overly beneficial for India and lacking sufficient safeguards to prevent New Delhi from continuing to produce nuclear weapons. "We are going to be sending, or allowing others to send, fresh fuel to India - including yellowcake and lightly enriched uranium - that will free up Indian domestic sources of fuel to be solely dedicated to making many more bombs than they would otherwise have been able to make," says Henry Sokolski, executive director of the Nonproliferation Policy Education Center, a nonprofit organization dedicated to improving awareness of proliferation issues. While India has pledged that any U.S. assistance to its civilian nuclear energy program will not benefit its nuclear weapons program, experts say India could use the imported nuclear fuel to feed its civilian energy program while diverting its own nuclear fuel to weapons production. New Delhi has done similar things in the past; India claimed it was using nuclear technology for civilian purposes right up until its first nuclear weapons test in 1974. A Congressional Research Service report on the agreement states, "There are no measures in this global partnership to restrain India's nuclear weapons program." COLORADO AND SOUTH DAKOTA URANIUM TO U.S. UTILITIES OR INDIA? Do Powertech founders Richard Clement and Wallace Mays have a plan to sell uranium from northern Colorado and South Dakota to WM Mining and then to the Government of India, rather than to U.S. electric utilities? And could such sales have the effect of indirectly supporting the Indian nuclear weapons program? We may never know the answers. We do know that all the talk from Powertech about supplying uranium only to U.S. utilities is just public relations hype. Powertech's declared concern for U.S. energy security was always suspect, and the Synatom and WM Mining/NFC deals demonstrate just how shallow that concern actually is. The Powertech Team - Powertech Uranium Corp.